This house has been designed to comfortably fit 2 – 4 pygmy goats. However it can be adapted to perhaps house your sheep. This Model can be adapted to suite poultry and can easily house up to 25 hens with roll away nest boxes inside. 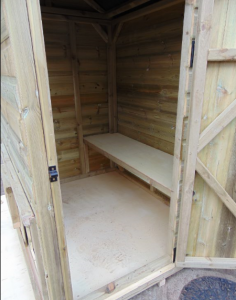 This Model can also be adapted to suite poultry and can easily house up to 25 hens with roll away nest boxes inside. 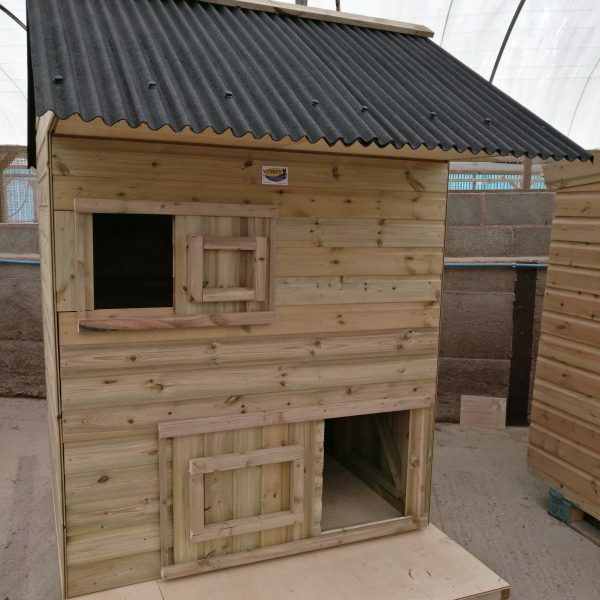 It has been hand-crafted by an on site Carpenter using only strong pressure treated quality timber and corulline, corrugated onduline mini profile roof sheets. This design, features a vertical slide door, for the goat’s entrance and exit, as well as a high level air vent and as shown in the images and a door on the side for human access. 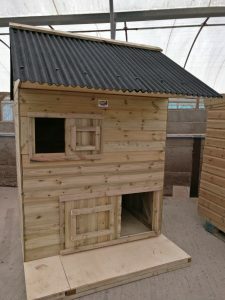 There is also a veranda at the front where dry food can be put, or where goats can relax but stay out of the rain as the roof covers the entire veranda area. 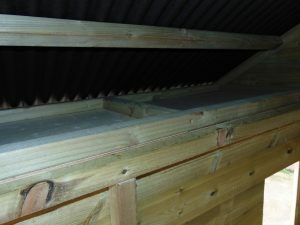 Inside, you will find a overhead internal storage, a ledge where the goats can relax or sleep. (As goats like to be off the ground, they will find this a comfortable place to sleep). Strong, durable, versatile shelter suitable for goats & chickens. As these are all built modifications can easily be made if the standard design doesn’t quite fit work for you. Over head storage a great addition to keep feed out of reach. 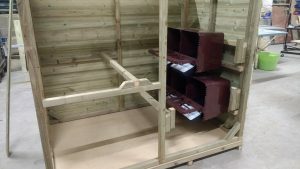 Have chickens Not a problem we can adapt the shelter to fit in roll away nest boxes and can easily house up to 25 hens. Strong, durable, versatile shelter on raised skids to combat damp.